Rifleâs C.J. Vondette won her first Mountain States Circuit barrel racing championship this year thanks in part to the recovery of Grizz, an 18-year-old gelding who recovered from a major injury in the summertime to compete again this past October. Rifle’s C.J. Vondette, even though she depends a lot on her horses for her barrel-racing success, said she depends on plenty of other people to make that success happen. RIFLE — C.J. Vondette gets teary eyed when talking about her most recent championship barrel racing season, especially when it comes to her horse, Grizz. Grizz, also known as Cache A Mount, is an 18-year-old quarter horse that has been the go-to gelding for a girl making her way up in the barrel-racing rankings of the Women’s Professional Rodeo Association. A severe injury during a routine ride in the summer, however, raised questions about Grizz’s short- and long-term health. That injury — a severe gash in Grizz’s right front leg — sidelined Vondette’s top horse for two months while the injury healed. But by the time that the circuit finals took place in Loveland at the end of October, Grizz performed like anything but the grizzled horse that a lot of people might have been expecting. The championship was the first on the circuit for the 24-year-old Vondette, who managed a second-place finish on the circuit and in the finals average in 2012 — the same year she won the circuit’s Rookie of the Year award. Her chances at bettering that looked really good in the beginning of July when she took first in barrel racing at the Greeley Independence Stampede, which each Fourth of July weekend is one of the nation’s biggest rodeos. The victory earned Vondette $8,345 by the end of the weekend. Not long afterward, however, Grizz suffered the potentially debilitating injury. While C.J. and her sister, Devon, were out exercising their horses on the west end of Rifle, Grizz ran into an implement sitting on top of a hill and sliced his entire right gasket muscle open. The wound was so severe, Vondette said, that it made a five-inch-deep incision in the muscle. So severe was the injury that, after Grizz had been loaded into the trailer to bring him to Glenwood Springs for treatment, Devon and a family friend, Dina Miller, had to ride along with Grizz in the trailer and hold the horse’s muscle in place to keep it from falling out of the leg. Then another setback came after Grizz had been stitched up, when an infection had developed in the leg and eaten the muscle from the inside out, extending Grizz’s recovery time from one month to two and left a five-inch-deep gash in the leg. Meanwhile, Vondette spent Grizz’s two-month recovery period riding Mikey, a 5-year-old gelding that was seeing his first-ever action in a professional rodeo arena. She took him to several rodeos — including the Garfield County Fair in Rifle — and still brought home paychecks with many of her performances. Grizz was finally ready to run again at the beginning of September after his wound had healed enough, and he came out to compete again during the Professional Roughstock Series at the Budweiser Events Center in Loveland, winning the event in his return to competition. Then, on Sept. 27, Vondette rode him in Loveland again and finished 10th in a semifinal qualifier for The American, a rodeo that takes place next year in Dallas that offers the world’s richest rodeo purse. The biggest win, however, came during the Mountain States Circuit Finals Rodeo in Rock Springs, Wyoming, from Oct. 23-25. Vondette and Grizz didn’t start out hot with a fourth-place finish in the first round, but they took first place in both the second and third rounds to not only win the titles in the circuit and average, but Grizz earned awards as the circuit’s Barrel Horse of the Year and its Horse with the Most Heart. Now, however, she turns her attention to where she’ll go for the upcoming season and what her goals will be. She wasn’t certain of that at the end of November, but she was certain that she’ll have a chance to be even better with two experienced barrel horses — Grizz and Mikey — at her disposal. 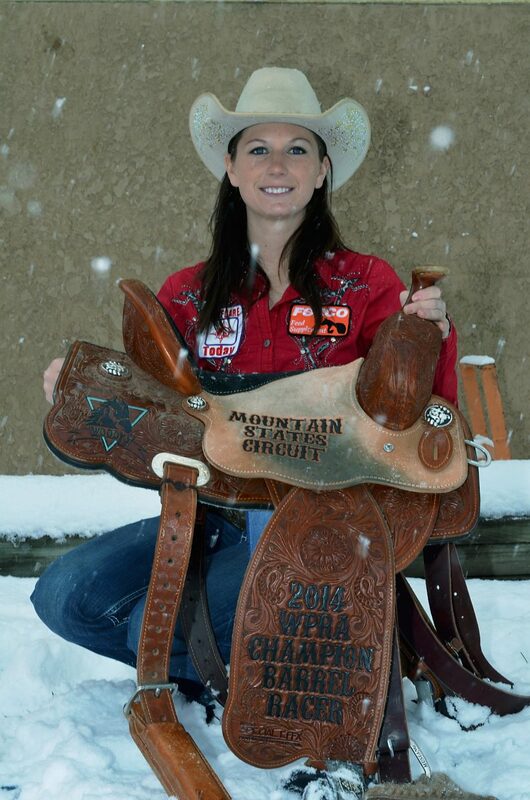 Other than the semifinals for The American, she plans to run Mikey at the “Colorado vs. the World” rodeo in Denver on Jan. 9 before running Grizz two weeks later. It’s all with the hopes that, after this year, she’ll finish even better in 2015.